Even if it does not have monetary cost (like a freemium membership/software or a free trial), it requires enough value to overcome the cost to your prospect of signing up for an account, providing an email address, etc. Really, who the heck wants to sign up for yet another free account? 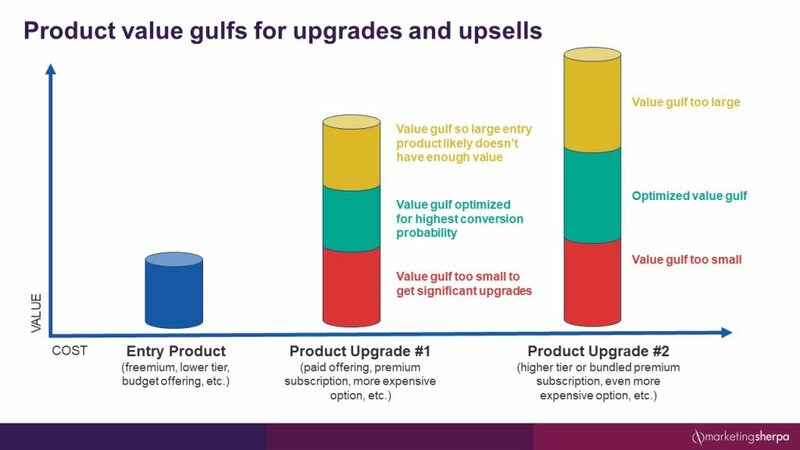 If the value gulf between the upgrade and the entry product is too small, conversion will suffer. I chose the phrase “value gulf” very carefully. A gulf is a yawning abyss or ravine. Visceral I know. But there has to be that large of a gap for a customer to go through the excruciating pain/cost to upgrade. This is especially true if the upgrade is from a free trial or membership to a premium membership that costs money, as is the case in the freemium model. Remember, a price increase from $1 to $2 is a 100% increase. However, an increase from $0 to even just $1 is an infinite increase. The incremental perceived value differential must be similarly large. Hence the term value gulf. Even given what I just said, you can overdo the value gulf. This likely means that the previous tier does not provide enough value. In other words, you can be shortchanging your entry product, especially when the entry product is free. Remember, there is no such thing as free. Even a free membership costs the customer the friction of becoming a member. Even ungated free content costs the customer time to read it. Freemiums or free trials are zero-dollar entry products but must still have enough value to serve a customer and entice them to “purchase.” If your value gulf is too large, it means you should shift some value from a higher tier to a lower tier, possibly from paid to free. Here are a few examples of creating value gulfs. (And if you have any examples you want to share, feel free to message me @DanielBurstein on Twitter). There are many intangible products in lower tiers of product cost hierarchies. This is especially prevalent in membership offerings. A nice example can be seen in the rock group Pearl Jam’s fan organization, Ten Club. Members can upgrade to tangibility for twice the cost. A Digital Membership costs $20 per year, but for $40 per year, you can get the Analog Membership, which includes tangible features like a print magazine and a vinyl record. That is a large enough value gulf to encourage the ideal customer to upgrade their membership, while at the same time, the digital offering has a strong enough value proposition to attract entry-level members in its own right. If you’re a marketer, when I say “better customer experience,” you’re probably thinking of the classic product upgrade — first-class in an airplane. Wide leather seats. Champagne and a hot wet towel. No riff-raff. Airlines have gone out of their way to create a value gulf between two seats located mere feet apart in the same aluminum tube going to the same place. And, hey, they’ve done a good job. I want that first-class seat as much as you do. A better customer experience doesn’t only come in the form of warm nuts served before a flight. For example, I was in Starbucks on Sunday, and I bought a print copy of the Florida Times-Union, our local newspaper. I could get the same info online. But there’s just something to sipping a coffee with a crisp print newspaper instead of craning my neck and staring at a device screen like I do all week at work. It was a strong enough value gulf that it warranted a purchase. Many free or freemium services are supported by ads. While the upgrade from free to paid is infinite, most customers understand a pretty clear value exchange of paying more to not receive ads. Ad blockers have made this a more explicit and clear value gulf. For example, here’s how Wired magazine is handling ad blockers — giving the customer the option of upgrading to a premium membership. Different customer segments will react differently to value gulfs, but the time saver value gulf is probably most pronounced. For example, an unemployed person might be much more likely to invest time to get something than pay for a premium version with no ads, while a high-earning, employed individual would be more likely to do the opposite. This is an often-used value gulf — you get more features for a higher cost. For an online purchase, a feature matrix is a common way of communicating this. For example, back when MarketingSherpa had a membership offering, a feature matrix increased conversion by 75.89%. Be careful what order you offer upgraded features in. For example, when I bought my car, I test drove the Nissan LEAF SL first, the car’s highest timeline. I was worried the LEAF would be too much of an econobox. But when I test drove the SL, it was pretty nice. Leather seats, navigation, touchscreen display, quick charger, solar panel spoiler, automatic climate control, etc. But then I test drove the base S version next and I didn’t like it at all. It felt like an econobox. If I had driven the S version first, I probably would have written off the LEAF entirely and bought another car. I don’t want to end this blog post without calling out the most obvious value gulf that can encourage a product upgrade — just plain more (usually a larger size). In this case, pricing strategy has a major impact. Let’s use Starbucks as an example. For this coffee chain, much of the incremental cost is probably in the cost of labor (making the drink) not the ingredients of the drink itself. So, it’s no surprise that when you double the size of an Iced Caramel Macchiato from a 12-ounce Tall to a 24-ounce Venti, the price increases only 32 percent (from $3.75 to $4.95). There is a clear value gulf (twice as much yummy beverage) but a relatively small increase in cost (“eh, it’s only about a buck more”). They end up leaving with significantly more value (a much larger beverage). But this example merits bringing up the point that it is important to understand your customers’ non-monetary costs as well. In this case, a Tall Macchiato has 180 calories, but a Venti has 350 calories. That might be a large enough cost increase to dissuade a customer from upgrading regardless of what the monetary cost is.